David Hockney / Me Draw on iPad. CC image courtesy of TonZ on Flickr. Recently I had the opportunity to observe an art education program at the Brooklyn Museum with some fellow students for a course we are taking about art education outside the classroom. The program’s theme was traditions, and it began with a trip to the galleries to see an exhibition about the American Indian Tipi followed by an activity where the participants, aged 4-7, completed a painting about a tradition from their own lives. As my classmates and I observed the children painting, we became distracted by another child in the room. He was too young to participate, so he sat in his stroller, alongside his parents…drawing on an iPad. It was a startling juxtaposition, as the youngest person in the room created art using the highest level of technology, amidst a dozen older children expressing themselves through a far more low-tech means (and tackling the subject of tradition, no less!). But it’s not just children so young that they will grow up not knowing life without an iPad who are embracing technology as a viable medium. 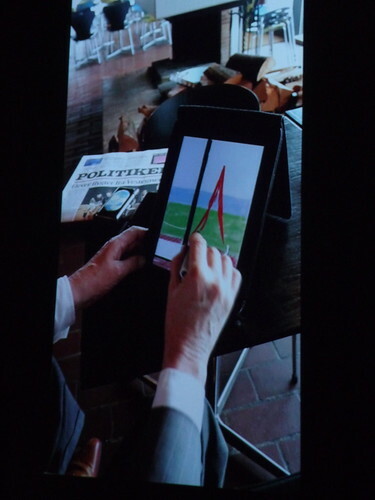 One of my favorite painters, David Hockney, uses an iPad to create works of art—and he is 73! Hockney hasn’t given up on paints; rather, he uses the two media together. “The iPad is influencing the paintings now with its boldness and speed,” he told the LA Times. The National Endowment for the Arts is also recognizing this shift in arts consumption. A new analysis of the NEA's Survey of Public Participation in the Arts from 2008 includes participation through electronic media in its count of how many Americans consume the arts. Now listening to music through an iPod or Pandora counts; so does reading on a Kindle and (though the iPad didn’t exist in 2008) drawing on an iPad. In the past, emphasis was more strongly placed on attendance to plays, operas, ballets, museums, and the like. The result of this shift in understanding? The survey estimates that three out of four Americans participate in the arts. That statistic alone is an exciting piece of advocacy ammunition in budget battles being waged across the country right now—many of which are disproportionately affecting the arts and art education. It also serves as an important reminder to people of all ages about the ubiquity arts participation. The “benchmark arts” are important to measure, but not necessarily the best indicators of how many Americans enjoy the arts. It’s easy to forget that listening to music on an iPod—whether it’s Chopin, Radiohead, or Lady Gaga—counts as arts consumption as much as attending a ballet or going to a museum. The reason it’s easy to forget is that some arts participation isn’t even conscious—it’s just part of your routine. I think this would be a great topic for discussion in the art room. Do students feel that the art room is a vacuum—the only place they experience art in their lives? Or do they recognize the other more diverse ways that they participate in art just through everyday life?